NEW Onsite meet and greet service run by Edinburgh Airport located inside the Long Stay Car Park. Drop your car off right next to the Long Stay entrance, then jump on a bus to the terminal. There's no need to spend time looking for a car parking space with this hassle free service. Transfer time – 5 min Bus journey, runs every 8-10 min. Not ideal for disabled passengers. Please take a copy of your confirmation details via print or an electronic device. Non Flex - Dates can't be cancelled or amended. 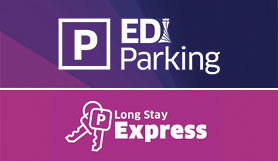 •Arrive at the car park as normal, take a ticket and follow the signs to the Long Stay Express car drop area. Our ferry lane drop off area is positioned closest to the entrance for a fast and convenient get away. •Once you have parked your car in the dedicated lane, you will be met by a member of the Long Stay Express team who will reconfirm your return flight details and take your keys. Catch the next available bus to the Terminal. •Our Long Stay Express drivers will park your car in a secure, on site location, for the duration of your trip. •On return, collect your transfer back to the car park at bus stop A. Hop off at bus stop 7, and collect your keys from the long stay express reception building. •This is a full Park Mark Award accredited car park. •Regular patrols, 24 hour attendants and full security fencing. •*In case of early/late return, customer must contact Edinburgh Airport to inform of return times, so car parking team can have the vehicle ready. You should then turn right, then follow signs to the Long Stay car park.